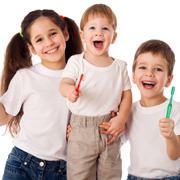 Kids of all ages can benefit from treatment by our San Pedro childrens dentist. Our dentist monitors children as their teeth and jaws develop to improve their chances of having good oral health throughout life. Trained in the field of pediatric dentistry in addition to general dentistry, our dentist is prepared to prevent problems as well as treat them with restorative techniques when necessary. Children who visit our pediatric dentist can receive treatment for a wide range of oral health issues in an environment that puts them at ease. By educating children on the importance of good dental hygiene, our dentist strengthens their ability to prevent problems such as tooth decay and gum disease in the future. Growth monitoring provides further safeguards against development of teeth and jaws that are more susceptible to oral health problems. In all treatments, our pediatric dentist incorporates child psychology techniques to keep kids from becoming scared of dental treatment. This strategy includes display of decor that appeals to kids, as well as avoidance of words that may upset them. Our San Pedro childrens dentist prevents oral health problems by working with parents and children in a number of ways. For example, children and their parents receive valuable information on the best ways of brushing and flossing. Further instruction may also be provided when children have certain oral health risk factors, such as malocclusion and mouth breathing. Because our dentist looks for growth problems in the teeth and jaws, parents can pursue early treatments to hopefully avoid more severe issues later. Braces are commonly recommended for young patients with crooked or overcrowded teeth, but treatments such as mouth guards and jaw surgery may also be useful for teeth grinding and other issues that can threaten jaw development and health. When parents visit our childrens dentist in San Pedro, they receive a comprehensive system of pediatric dental care to set kids on a lifelong path of excellent dental health. Understanding that communication is key to oral health during childhood, our dentist focuses on providing education in addition to easily tolerated treatments of all kinds. Parents can contact our dentist to discuss these services further and schedule a consultation.